We hope that most of what will happen in the future is that everyone in this world were to turn to join. Peace and happiness to the world refreshed. But we think that it will recognize the tragedy of the past. Many people lost their lives in that tragic conflict. This memorial is a sign of respect. The loss of life and believe in it. It is a symbol that represents children in the future peace of the world today that is now taking place. Cooperation from the all of us. When the Japanese troops land in Thailand Army No. 15 is the main role in building a road from Thailand to Burma, the plan is assigned to the eight points that people make is to build the Death Railway. said. The point is to separate the road from Mae Malai Amper Mm Mae Tang to Pai and go to Mae Hong Son and then Koon Yuam over the Burmese city of Toungoo. 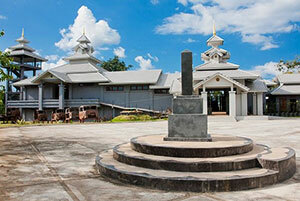 Mae Hong Son is the place, as the evidence or document to refer to. There are many places that I have seen of the Japanese Appliance. Especially at the museum. World War II military vehicles Tue Yuam the remains of Japanese cars in the traffic. And many other things. The wars are bring many horror images to who hear it always. But those who are destined to live in wars? It is difficult to predict. If we did not have it with our own fate. When the war ended, some of the more humane it is. As with the spirit of things with the Japanese soldiers on the retreat. From Burma through Mae Hong Son to Chiang Mai by the retreat. In Year 2488 when the Japanese surrendered. The lack of logistics. Morale is scarce. Food and medical supplies were scarce. Their route through the withdrawal of troops. The Japanese military to assist them with courtesy. It is possible that I can not forget the Japanese soldiers who survived. The companions of the war of the Japanese military in the war, these hearty enough to be remembered that any form of war, was buried at any place. In Chiang Mai and Mae Hong Son. They have to come back one day. Also that of the. To remember a friend of the military. When the wounds of war on the laminate and fade away over several decades. These companions went to war. Monument upon the soul of the late war. And do not forget to return to the community that had helped them to survive. The awarding of scholarships to the children or the community in different ways. In Mae Hong Son and Chiang Mai Always. Japanese soldiers during World War II Memorial. The second largest in the North is the place Mon Tue mother in me. Said that the Japanese soldiers killed during the fall and I was digging a grave. That the measure was not allowed (In the past located on San Pa Tong. The temple is located in the desert, Mae Wang) This area has old well so there’s a big grave of Japanese soldiers. For this reason. When the friend returned to the war memorial in a memorial which is the biggest I have ever seen. Now this place located at the rear of Bann Kard Vittayakom school, Chiang Mai can travel easily around 28 km from the city of Chiang Mai route - San Pa Tong Road and turn right onto San Pa Tong - I turn to the right place again. I put the district into approximately 1 km you will come home Sciences to Kad. Turn right into it. As a reminder that the battle for what. So that we can not forget the past. And a lesson for the future.